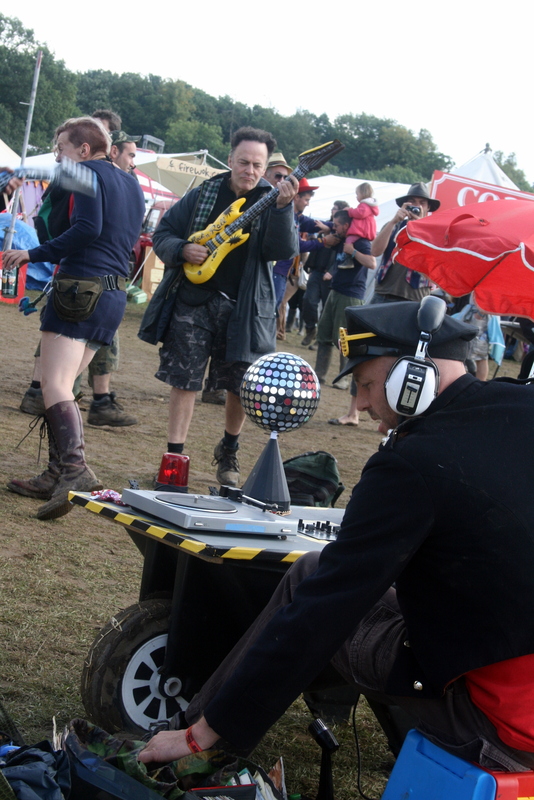 Shambala Story the shabby chic improvised wheelbarrow disco – Creative Dynamo Ecotainment! From the outset Tip of the Pops and Shambala seemed like a perfect match, shabby chic improvised disco meets colourful creative community festival with green credentials. Before I got a chance to book the time off work Shambala were chasing me to confirm and promised to mention Tip of the Pops in their mailing list … ‘Move Over Carl Cox’ was the tag line and it went out with lil’ ol’ me appearing alongside the likes of mercury music prize nominated Ghost Poet. This all seemed to be in sync with my ‘antidote to ipod‘ message and well on course for some serious fun. To add to the excitement the location and line-up is kept secret, all I knew was the date and roughly the whereabouts ‘somewhere near my sisters’ 150 miles away. On arrival everyone gets the same greeting – just like one of the family ! An online eticket system does away with wasteful and expensive paperwork and within minutes we were issued with our passes and back-stage to unhitch the trailer and check-in with the production office. Within an hour or two we had set up camp un-packed and were ready to explore Shambala land. With one baby and one 6 year old it was important for us to keep them occupied whilst also doing the necessary reconnaissance to scope out potential places for gigs. My mission was to pop-up and perform around the festival site giving impromptu gigs so we were on the look out for nice quiet places with space to dance and get a party started of which there were plenty. There was tons of activities for children and families, awe inspiring installations and art in a beautiful country setting and near perfect level play ground to get around. BIG shout-out to Jurassic Clay, the Baby Bath house, the Baby Space PLUS Coalescence-Collective Scrapmetal-artworks! Friday rain stopped play as it was impossible to get out and about with Tip of the Pops so time to further explore with the family, get a shiatsu massage, enjoy the children’s area, chill out with Electric Pedals phone charging disco and learn some circus skills. The weather certainly did not stop the atmosphere on site building with lots of fancy dress offerings and mud underfoot going hand in hand. A highlight for me was seeing two people dressed up as big red hearts going around loving everything and everyone, blowing kisses and giving hugs in full make up whilst wearing wellies. Saturday morning the clouds parted and we had plenty of time to get out and about and perform for an hour in the main arena before the main stage started. This was well received playing mostly 80s music using steadfast tunes that will almost all ways be in my suitcase where ever I go! Loads of people stopped and danced, took photos and we have some video that will be edited and available soon from this and other gigs at Shambala. It was just amazing to see so many up for it party people at midday some in fancy dress and others obviously warming up for the rest of the festival. Saturday evening Tip of the Pops popped up again near the burlesque Hurly Burly theatre cafe bashed out another storming set of cheesy disco and 80s poptastic hits to a crowd of about 50. I can honestly say I have never seen such a random bunch of characters at a party including MC Hammer, Elvis, a Leprechaun, Gangsters, Flappers, Colonel Gadaffi and a Pink haired girl in blue boa choreographing dance moves. On the way back to the trailer we met one crew member from Pirate Technics who design & build some of the incredible combustible site art – BIG shout out to Jamie and the disco dancers!